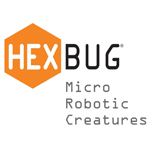 By leveraging their robotics expertise, Hexbug entered the toy industry in 2007 with the launch of the HEXBUG Micro Robotic Creatures product line. HEXBUG was designed to give children a positive experience with robotics at a young age. People are drawn to the HEXBUG brand for their products’ fascinating behavior, intelligent bug-like attributes and eye-catching packaging. Discover an all new realm of creative fun, with the HEXBUG Nano Nitro Habitat Set. This playset unlo.. The 360 degree turret style steering and LED forward eye allow you to maneuver it around objects and..